These rubythroats are found in parts of Afghanistan, Bangladesh, Bhutan, China, India, Kyrgyzstan, Nepal, Pakistan, Tajikistan, and Uzbekistan. They eat insects, spiders, mollusks, and small reptiles. During the breeding season, males sing for much of the day from exposed perches. Their nests are dome-shaped with large entrances on the side. These migratory chats spend their summers in Russia and Mongolia and their winters in Southeast Asia. They eat insects and nest near the ground in coniferous forests. 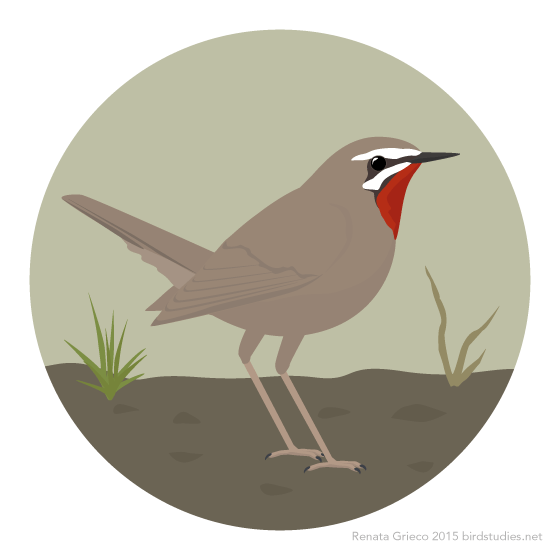 Only males have bright red throat patches, females are a more uniform brown. They have been seen as very rare vagrants in Western Europe and in the Aleutian Islands.